This week in Jordan, female members from 32 political parties came together to discuss how to expand the role of women in political life. 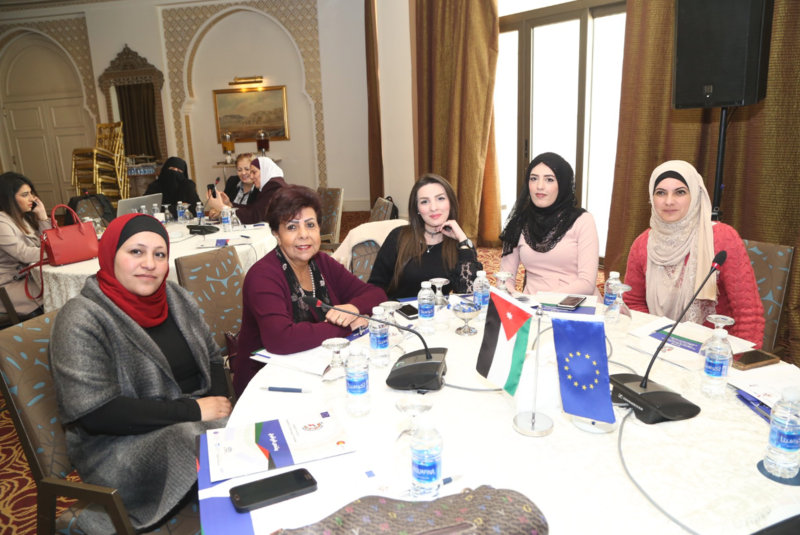 The event, ‘Women in Jordanian Political Parties: Challenges and Future Vision’, was organized by NIMD as part of EU-JDID, an EU-backed programme seeking to support democratization efforts in Jordan. At the conclusion of a dialogue session for female members of political parties held under the patronage of the Ministry of Political and Parliamentary Affairs (MoPPA), the participants issued a joint statement with their recommendations. The list of recommendations covers several vital issues, from party financing to guaranteeing female representation in party lists. The core aim of these policies is to ensure Jordan society is capitalizing on the benefits of equal gender representation, which range from greater transparency to more effective government policies. The document, which you can download below, lists proposed amendments to the Political Parties Law and Jordanian by-law on State Subsidies to Political Parties. It also lists the parties in attendance at the session. The fact that so many came, and were able to agree such a far-reaching list, is a milestone for all involved. Having trouble downloading the statement? Scroll down for the full list of recommendations. Increase the percentage of women’s quota in the Elections Law to allocate one seat for women in each electoral district instead of allocating one seat for women per governorate. Adopt a binding arrangement for women on the electoral list and this includes the Elections Law, Decentralization and Municipalities. Amending the Political Parties Law in accordance with the proposed amendments recently submitted by the political parties to the Ministry of Political and Parliamentary Affairs, in order to emphasize the main objective of enhancing the contribution of women and youth to political and partisan life within positive and encouraging democratic legislation. Abolish the regulations, instructions and procedures imposed by the university administration which prohibit representatives of political parties from addressing university students. The main criteria for financing the political parties shall be based on the number of votes gained or the number winning seats in the House of Representatives obtained by the political party on the basis that the funding continues for four years, (the term of the House of Representatives). In addition to providing a financial contribution to support the electoral campaigns of the party that nominates partisan candidates within realistic conditions. The recommendations are backed by female representatives of more than 30 parties in Jordan. Increase the percentage of women’s representation in party bodies and leadership positions, and allocate an additional financial share for the party that includes 30% of women and a larger share for the party headed by a woman. Ensure distribution of equal financial support to male/female candidates of the party running for elections. Establish an inter-party committee to monitor gender equality and equal representation of the different age group of the party and holding leadership positions within the party, its bodies and committees. The percentage of women candidates on the party list shall not be less than 20%. Provide additional financial incentives within the government financial support to the party with winning women candidates in the elections. Non-disbursement of financial support to the party, which depends on the nomination of candidates of the same gender and the need for women representation to be no less than one third on the list. Allocate a percentage of the financial support provided to the parties for activities that take into account the gender balance, and achieving justice and equality between them, whether within the electoral campaigns or the various partisan activities. Determine the ceilings of fundraising and campaign spending and identify clear criteria for transparency in fundraising and spending. Allocate 10% of the financial support provided to the party in which young people are nominated within its lists and 20% of the allocated support to each seat won by youth members of the party.